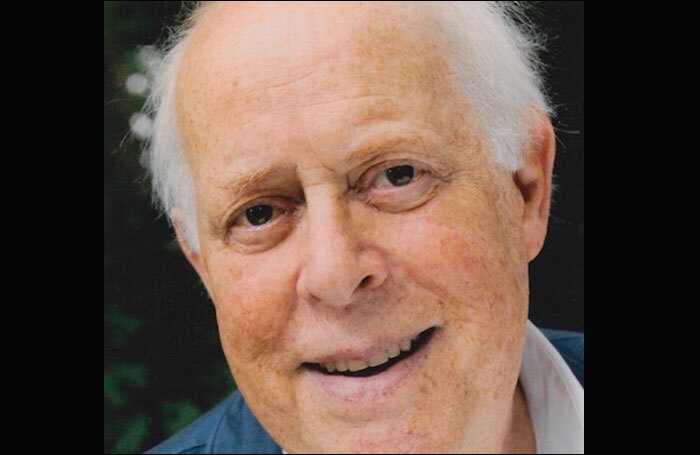 Clive Swift will be best remembered as the henpecked husband to Patricia Routledge’s painfully snobbish wife Hyacinth Bucket (“pronounced Bouquet!”) in Roy Clarke’s television hit Keeping Up Appearances from 1990 to 1995. But he was also a committed stage actor, spending a decade with the Royal Shakespeare Company at the beginning of his career and later appearing with Routledge in Keith Waterhouse’s Mr and Mrs Nobody at the Greenwich Theatre in 1994. A co-founder of the Actors Centre, he was active in Equity politics and author of two well-received books on the craft of acting. The son of a Liverpool furniture-retailer father, his interest in acting developed at Cambridge University where he read English. His peers in the Marlowe Society included Ian McKellen and Derek Jacobi, and his elder brother, David, was also to become an actor who found fame as news anchor Henry Davenport in TV newsroom satire Drop the Dead Donkey. Swift made his professional debut in 1959 in JB Priestley’s Take the Fool Away at Nottingham Playhouse. The following year, Peter Hall invited him to join his fledgling RSC ensemble alongside the likes of Peggy Ashcroft, Peter O’Toole and Dorothy Tutin. One of his first roles was as Sewerman in the premiere of John Whiting’s The Devils (1961) and he was seen alongside Vanessa Redgrave’s Imogen (Cymbeline, 1962), Paul Scofield’s King Lear (1962) and Macbeth (1967), and Ian Richardson’s Titus Andronicus (1967). Notable successes included Falstaff (The Merry Wives of Windsor, 1964) and a Parolles that was “brilliant and inventive” (The Stage) in All’s Well That Ends Well (1967). He last appeared with the RSC as Brabantio to Willard White’s Othello and Ian McKellen’s Iago for director Trevor Nunn in 1989. For Toby Robertson’s Prospect he was a memorable Caliban to Timothy West’s Prospero (The Tempest) in 1966, the same year playing Chichester Festival Theatre for the first time as Canton in George Colman and David Garrick’s The Clandestine Marriage. Later Chichester appearances included a “funny, surprising and alive” Bob Acres in Richard Brinsley Sheridan’s The Rivals (1971), Jean Anouilh’s Dear Brutus (transferring to the Piccadilly Theatre, 1971) and Terry Johnson’s Hysteria (2000). Swift scored a personal success as The Young Churchill, a documentary portrait of the politician, at the Duchess Theatre in 1969. A decade later, his idea about a brass band in a small Midlands town prompted Peter Buckman’s All Together Now, in which he was seen as the instigator of the band at the Leicester Haymarket. Among his other significant stage credits were Colin Welland’s comprehensive school drama Roll on Four O’Clock (Lyric Hammersmith, 1981), Martin Sherman’s Messiah, directed by Richard Eyre (Hampstead Theatre, 1982), Howard Brenton’s The Genius (Royal Court, 1983) and Arthur Miller’s adaptation of Ibsen’s An Enemy of the People (Young Vic and Playhouse Theatre, 1988). 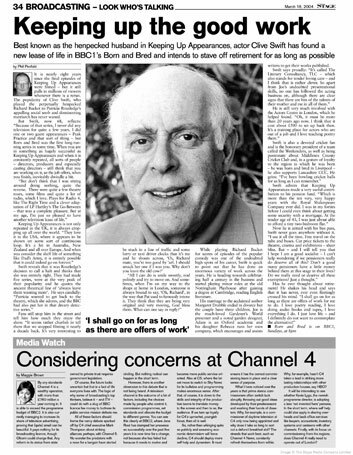 A familiar voice on radio drama, notable roles included Willie to Geraldine McEwan’s Winnie in Samuel Beckett’s Happy Days and Hitler’s step-brother in Marcy Kahan’s Everybody Comes to Schicklgruber’s in 1996, and faded philosophy professor Marvin in Arnold Wesker’s The Rocking Horse Kid, marking the 75th anniversary of the BBC World Service, in 2007. With more than 110 screen credits, Swift was a familiar face on television and film, having made his small-screen debut in Peter Hall’s 1961 production of Jean Giraudoux’s Ondine. His swansong was a 2017 episode of Midsomer Murders. In the late 1970s, he served as secretary to the campaign that led to the creation of the Actors Centre in 1978 and was active in Equity throughout his career. He also taught and directed at LAMDA. He published two books: The Job of Acting (1976) and The Performing World of the Actor (1981). Clive Walter Swift was born on February 9, 1936 and died on February 1, aged 82. He was married to the novelist Margaret Drabble from 1960-75 and is survived by their two sons.